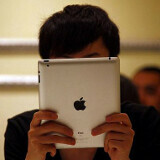 When the iPad 2 was released in China last year, there were some incidents that kind of ruined the mood of the launch day, especially in a busy Beijing store. Today, during the new iPad's launch in China, however, it's reported that there has been a line of only 40 people in front of the same store, and there was no sign of disorder. Could this mean that demand for Apple gadgets in China is falling? Well, it's too early make any such conclusions. Some are explaining the much smoother and quieter release with a new system that Apple introduced for the new iPad launch. Apparently, customers were required to take reservations for the product a day earlier. Then, after receiving a confirmation, they were allowed to visit the store and pick their iPad up. Another reason for the lack of chaos could be found in the fact that the new iPad became officially available in China much later than it did in the rest of the world. Some are explaining this with the legal dispute over the iPad trademark that Apple had to sort out. Last but not least, there has obviously been some heavy security presence during launch, which has surely helped a lot too. Confucius say: not true, in China everyone can go get a cheap (plastic) knock-off at the corner bodega. Or, on any restaurant menu. That doesn't really counter IamYourFather6657's claim. Even if it is a knockoff, they will still feel like they have the high status since other people will think it's an iPad as well. Ur comment was jus plain stupid. Online ordering has much to do with this. I'm quite sure the iPad will boast beautiful sales. John B.
I guess the Chinese are waiting for N7, iPad is not cool anymore. That is due to the economic slump. The first sentence of this article is a grammatical disaster. Smh. Oh no. The way they are treating Chinese customers is not good. That will cause a huge loss to Apple. Remember China is the Worlds most populated country. So,bad service may inflect in fall of profit.